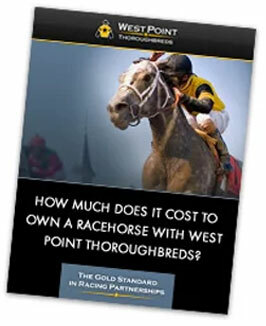 Why is there a markup on West Point Thoroughbreds’ horses? What's the value proposition? These are questions I’m sometimes asked by people who are thinking about getting into racehorse ownership. There’s value in sitting back and enjoying the experience of watching your horse compete without worrying about extensive operational details – you benefit from expert institutional knowledge and know that top industry professionals take care of your horses. Sure, you could buy a racehorse on your own and not pay additional fees. But, who would you talk to? How would you go about selecting horses at a sale? How would you transport your horse after purchase? Do you have access to the sport’s best trainers and jockeys? These are just a few of the myriad issues you’ll face as a new owner going out on your own. To that I say, “huh?”. Also, it’s not hard for an individual with minimal experience in this game to hang a shingle, go to the sales, and start a partnership. By investing with WPT you’re investing in years of experience from a team of knowledgeable people passionate about our clients and horses. -Access to the best people and venues in the business. We’ve built relationships with industry professionals that take years for someone to develop on their own. You could be dreaming of owning a racehorse one day, then become a Partner on a runner under the care of Derby-winning trainer H. Graham Motion the next. We give our Partners opportunities to be part of industry events and participate on racing’s biggest stages on the biggest days. –Consistent Communication with Partners on every member of their stable. I guarantee you’ll have one-on-one contact with a member of my team on a regular basis, and our top-of-the-line website is the best of any partnership group in the industry. We provide workouts, race information, news, and a variety of new content every day. You can also watch replays of every WPT race and enjoy features on key subjects. –Performance: on the racetrack. Since 2005 our runners have won at a 20% clip, hit the board 50% of the time, and earned over $20 million in purses. Our horses and Partners have competed in the Kentucky Derby, Preakness, Belmont, Breeders’ Cup, Travers, and Hong Kong Mile. Our runners have earned some of the most prestigious graded stakes trophies from coast to coast. We’ve won races in Canada and Dubai. Grade One winners include Awesome Gem, Dream Rush, Flashy Bull, Irish Smoke, Lear's Princess, and Macho Again. -Customer Service is a priority. We do everything we can to make sure our Partners enjoy their experience. Whether it’s seating at the track, a private barn tour, or a chat with a Hall of Fame trainer, we’ll work to make it happen. –Creation: of each partnership. This includes filing fees for each and every state our Partners reside in. –Management: of each partnership. My team (including our trainers) discuss each and every horse every week. Regular topics include overall progression, race selection, circuit changes, competition levels, race data (Beyers, Ragozin numbers, etc), gelding, surface chances, time off, equipment changes, etc. To better align our interests with those of our Partners, we eliminated the monthly management fee for our partnerships, beginning in January 2012. We do, however charge a monthly administrative fee for the ongoing cost of doing business. –Assumption of risk: when syndicating a horse. You own 5% of a horse, and you’re not at all responsible for the remaining 95%, even if some of your Partners dont't pay training bills (that does happen once in awhile!!). WPT does not acquire capital upfront before buying horses- our clients have a choice as to which horses they invest in. If something happens to the horse before it is syndicated, WPT absorbs the loss. –Acquisition costs: to acquire athletes. It’s expensive to perform the work and diligence required to evaluate and analyze prospective racehorses. X-ray diagnostics, veterinarian assessments, throat analyses, heart scans, stride analyses, and physical observations are just some of the costs associated with finding the best young racing prospects at public auction. Don’t forget actual sale price of the horse when the hammer drops in the sales ring! –Institutional knowledge: from years in the business. I’ve been doing this over 20 years – and made most of the mistakes that can be made by an owner. No doubt I’ve learned fromthese mistakes. My team is comprised of people knowledgeable and passionate about racing as well. –Education: for Partners. We actively blog on our website about industry topics and want our Partners to know the ins and outs of the game. Helping our clients learn more about this wonderful industry is important to us. -Accounting/Administration duties are taken care of for you. For somebody who just wants to enjoy horse racing, accounting can be a hassle. Let us take care of paying the bills, providing quarterly statements, and arranging tax information. We pride ourselves in financial transparency. Our CFO Lindsey Huemann is a Certified Public Accountant. You know the old adage, you get what you pay for. I believe this especially holds true in racing partnerships. 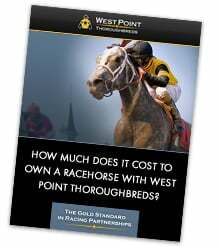 West Point is not for everyone wanting to enter into a racing partnership, but we can deliver a premium level of service and experience that can create a lifetime of memories, friendships, and camaraderie surrounding one of nature’s most inspiring creatures, the Thoroughbred. So, that’s our take on “markups”.